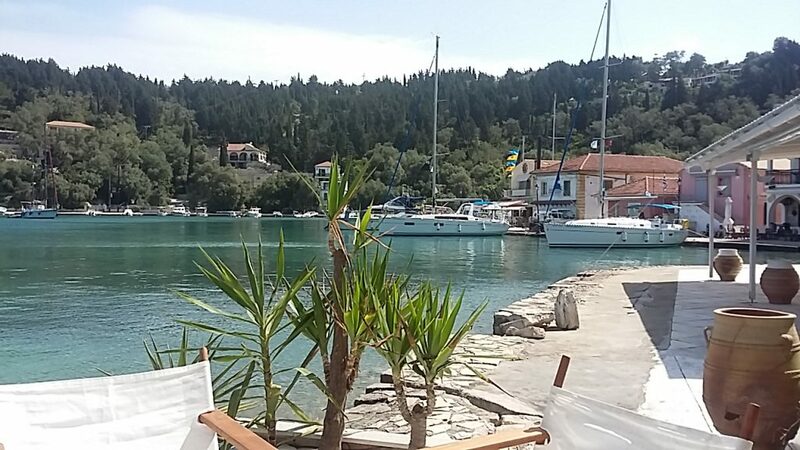 After our swift passage to Paxos we decided to hang around for a few days and spend my birthday in Lakka. Having settled in we had a series of suprises, one nice, the others not so much. First we discovered that some friends from Roccella were here, Jim and Karen in Mai Tai had arrived a few days earlier. We spent an evening with them before they set off again. That was the nice suprise. The not so nice ones were mechanical. The generator still won’t run properly. The leaking salt water impeller which I had fixed in Roccella was likely only the symptom and not the actual problem as it appears the exhaust cooling water is not getting through to the exhaust, causing it to over heat. 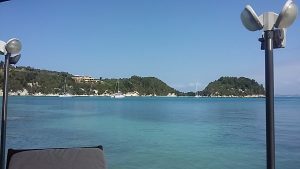 We have arranged for repairs in Lefkas but now have to annoy the anchorage every day running an engine to top up the batteries. And being anchored, we need our Tender to get ashore. The out board engine has decided to pack up and I think it is the carburettor float valve is stuck. Not so difficult to fix if you have the spare gaskets …… which I don’t. But we’re off to Lefkas so in the mean time I can row, having glued the rowlock back on which decided to fall off just as I needed it. So, my birthday started with loads of texts from friends and relatives. 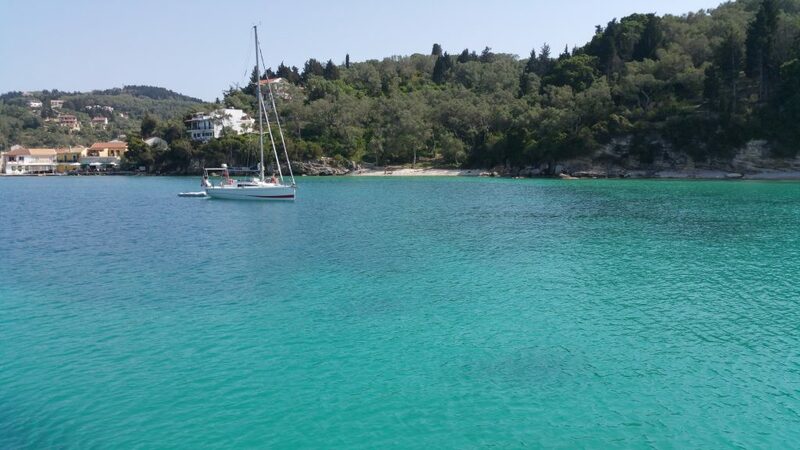 I then rowed us ashore as we were in search of Paxos Olive Oil, once exclusively sold by Harrods. We found the Olive Oilery but it was deserted and so sat and drank wine and used the WiFi at a bar over looking the anchorage for lunch. They were only serving omlettes and toast so I decided to save my self for my birthday BBQ, and a quick turi pitta (phonetic Greek for cheese pasty) from the baker on the way to the Olive Oilery on our second attempt at a purchase. Whilst in the bakery we asked if the lady knew when the Oilery might be open. She pointed to a guy chatting in the street, “That’s Antonis” (the Oiler). Don’t you just love tiny villages! 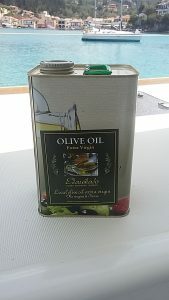 So we have 5 litres of Paxos Olive Oil! It was then back to the boat for the Birthday BBQ; nice big home made burgers and a couple of steaks ……… and some salad, because I am so healthy ……..
At this point, under more favourable mechanical conditions we would probably have set off south again as the wind turned around to the north. 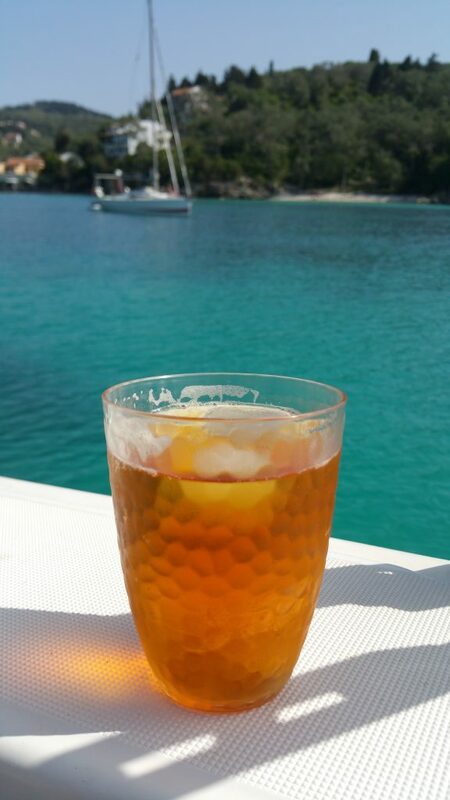 However; we now needed to be in Lefkas on Monday, arriving after all the Charter boats had left. So we planned an early start on Monday. As it turned this was a good plan as the weather over the weekend worsened progressively ending up with 30 knot winds and lots of rain on Sunday night. Lakka was a pleasant stop over for our first visit of the year. 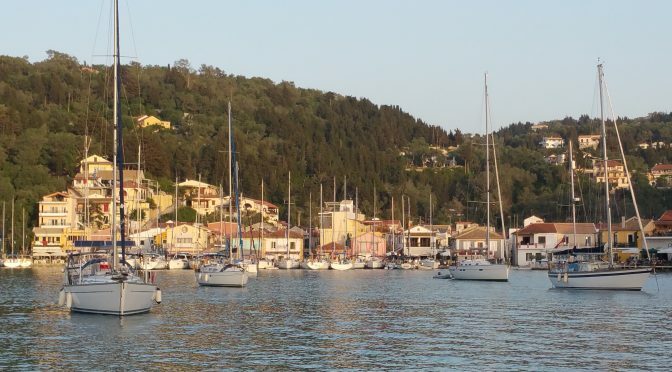 The town is small, quaint and we could have enjoyably visited on a daily basis, outboard and weather permitting. Maybe another visit in September as we return to Roccella?